As the summer heats up, the sun gets stronger and your fish become more active. 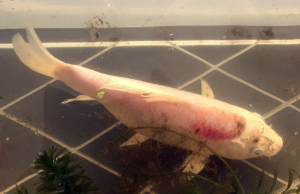 There is something that a lot of koi owners might not know—your koi can sunburn. Like other animals that lack hair or a fur cover, a koi can get sunburned when exposed to too much direct sunlight. It is something that many koi enthusiasts might overlook. Redness, that is characteristic of sunburn, can also suggest stress in predominantly white koi and can represent high levels of ammonia in a pond or even parasites. However, if none of these are evident, the redness could be sunburn. Koi are sun lovers, and they generally like to bask in the sun. Too much basking or time spent close to the water’s surface exposes a koi to the more harmful UV rays and can lead to koi sunburn. Non-metallic white or mostly white fish are especially at risk. The sunburn diagnosis has stumped more than a few koi kichi and even koi dealers. It is not a common ailment, but it can have lethal results. How Do I Know That My Koi Has Sunburn? A koi is a living organism and, as such, has a natural response to sunburn. Given time and shade, the affected area will regenerate and heal. The sunburned area will eventually peel off and the slime coat over it will grow back. This process can take up to two weeks, so it is important to keep a close eye on the affected fish. So what are some of the factors that can contribute to your koi getting a sunburn? As water gets deeper, light penetration decreases. UV light will dissipate gradually in fresh water (especially if it has some turbidity). A deeper pond will not help to cut out all of the UV light (since longer wavelength UV light penetrates deeper); however, it will allow your koi to get out of the sun’s more damaging rays in the shallower water. Believe it or not, that crystal clear water koi owners yearn for can actually be one of the contributing factors to a koi’s sunburn. The clearer the koi pond water, the easier it is for the sun’s damaging UV rays to reach deeper into the pond. As the water heats up, it loses its ability to hold dissolved oxygen. If you are not supplying adequate dissolved oxygen into the water column, your koi can come up to the surface to look for more oxygen. Some koi just like to play “Jaws.” They will spend time at the surface and poke their dorsal fins out of the water. Spending a lot of time near the surface will expose them to more direct sunlight, which can lead to sunburn. The slime coat is not only good for helping to keep your koi healthy and resistant to parasites, it is also helpful in lessening the effect of the sun’s rays. A healthy koi with a full slime coat will stave off sunburn longer. Dipping your koi or treating it for parasites can sometimes affect the slime coat and make it more susceptible to a sunburn. Be wary of this if you are treating your pond or koi for parasites in the summer. So without slathering SPF 50 all over your koi, how can you protect them from the sun’s harmful rays that cause sunburn? This is the simplest solution to the problem. Shade comes from more than one source and can be natural or artificial. Adding shade outside, inside, or on top of your pond can help prevent koi sunburn. Trees make for great natural shade (but can be a real pain come fall). Man-made structures like sail cloths, decks, pergolas and even tight-knit netting can all give your koi some relief from the sun. Some enthusiasts will add caves or tunnels into the design of their ponds. 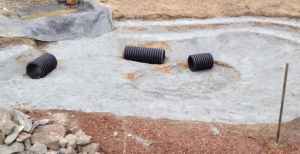 This can be done as part of the build itself or by laying plastic tubing at the bottom of the pond after it has been built. These tunnels or caves also have the added benefit of offering protection from predators. In lieu of being able to add shade above the pond, using a dye to block out the sun’s more damaging UV rays is an alternative. There are different colors available, although blue and black are the most popular. The dyes are non-toxic and have the added advantage of helping to reduce algae growth, too, as they keep the sunlight to a minimum. There are a variety of aquatic plants that provide protection from the sun while offering a little boost of color on the water’s surface. Water hyacinth, water lettuce, water lotus and waterlilies are amongst the most popular floating plants for koi ponds. Some koi enthusiasts opt to add floating islands to their ponds. These can range from simple pieces of styrofoam to fairly intricate islands complete with foliage and plant life. Keeping your koi sunburn-free is not a difficult task. Knowing what it is, how it is caused, and how to diagnose and treat it will give you an advantage if it should ever happen to your koi. With a little diligence and a few additions, you can ensure that your koi are healthy and happy in the summer months!